It is absolutely adorable to see how well Scratch and Violet get along. They have really taken to each other, and I couldn’t be happier about it. 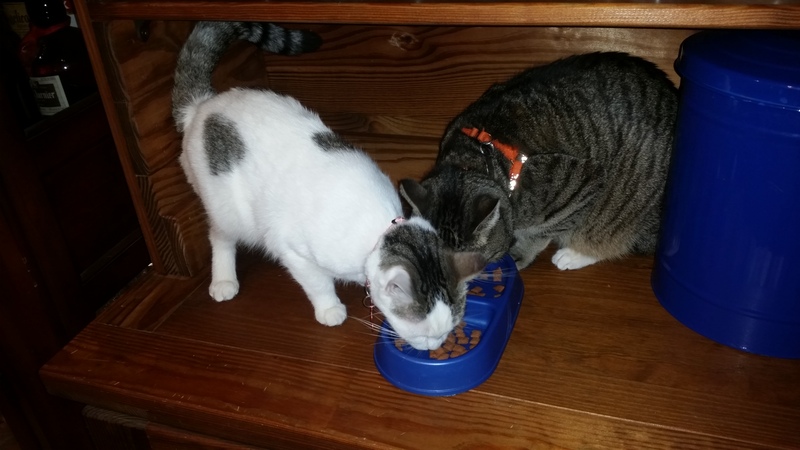 They can actually eat together and not fight. This past Friday we took Violet to the vet for a dental, and it is almost certainly the first one she has ever had in her life. So poor baby girl had to have some teeth cleaned and a LOT of teeth pulled. But she seems to be feeling better already. 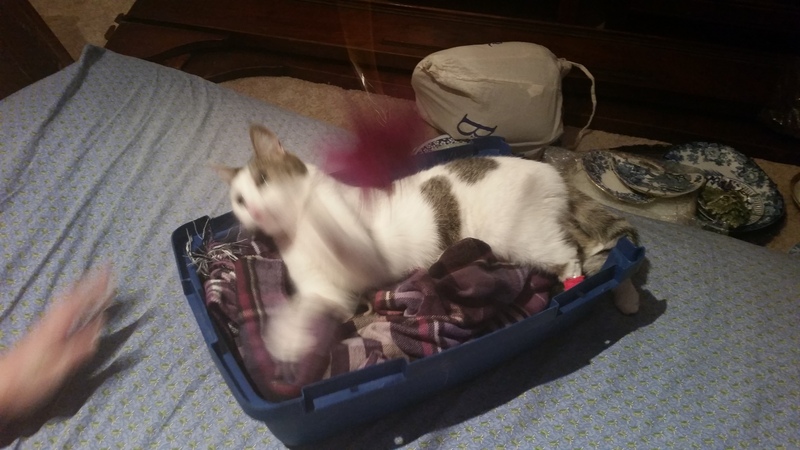 That purple blur is a string toy that she is batting at like crazy. Her appetite is the best I have ever seen it. She used to just pick at her food, probably because it hurt her to chew. But now she is really chowing down on the soft food. I thought it might be because it’s yummy soft food, but she actually started eating the kibble before I put the soft food down for her. She seems so happy. Everyone at the vet fell in love with her, because she is such an affectionate little girl. She will rub noses with you if you give her the chance. And she has rubbed noses with Scratch a few times, and even Dash once or twice. Can’t say if she has ever done it with Thumbelina. 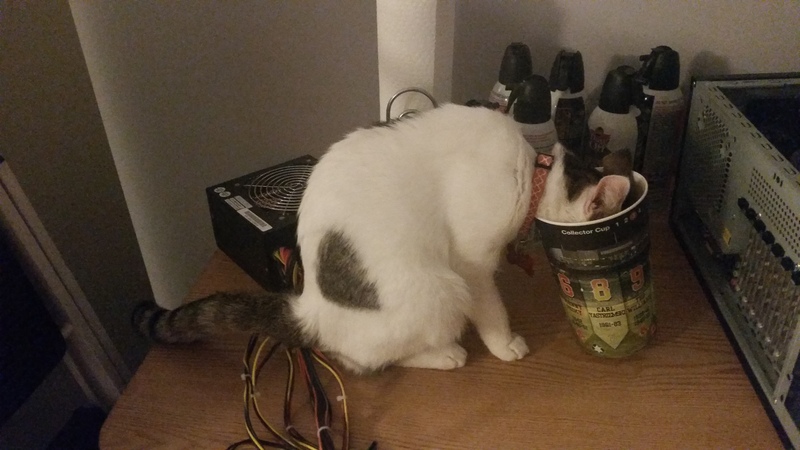 She is so small that she was able to fit her whole head in this cup to drink the water that was in it. Funny side story about Dash. Today I leashed him up and took him to the pet store to get some rawhide sticks. And while we were there, I saw a bin full of what looked a bit odd. 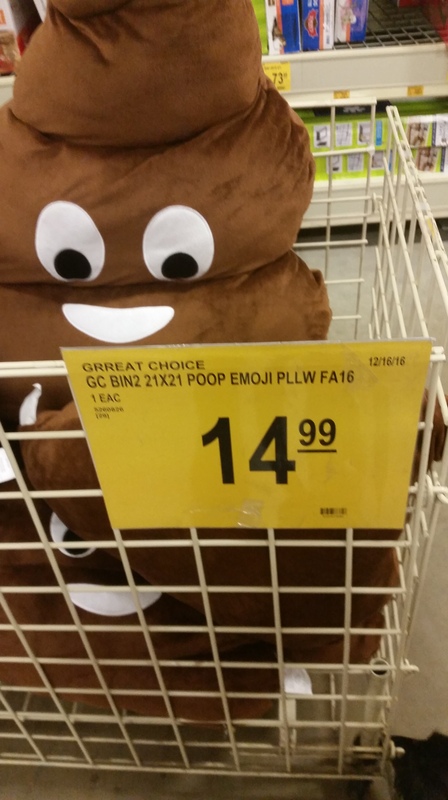 When I got close I realized what it was: poop emojis. There were several different sizes. The cheapest ones were these. Suddenly, with no prompting from me, Dash decided that he needed to take a dump, right then and there. It was if he looked at the little stuffed emojis and said “That reminds me, I need to go. Well, this must be as good a place for it as any. ” And so he pooped next to the big bin of fake poop. And no, I did not get a picture of him doing that. I was a bit too flustered trying to find the bags and the stuff to clean it up to think about preserving the moment for posterity. Kelly was disappointed. Previous Previous post: It’s my last show of 2016!